New York: Amy Einhorn Books / Published by G. P. Putnam's Sons, A Member of Penguin Group Inc, 2009. First Edition. Hardcover. Fine/Fine. 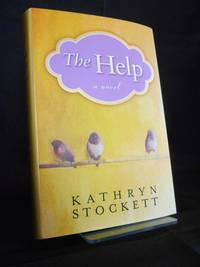 Octavo size, 461 pp., inscribed by Kathryn Stockett. This book explores relations between African-American maids and their white employers in the South of the early 1960s, told in an intimate style that touched the heartstrings of so many of us, whether through reading the book or seeing the film version produced two years later (which received four Academy Award nominations). This copy is inscribed by the author, simply, "To Linda" on the title page, with her signature below, "K Stockett", and it is accompanied by a short typed letter from the publisher, Amy Einhorn, who presented this copy to the "Linda" (no last name), stating "You were so kind as to be an early champion for Kathryn Stockett's novel, THE HELP. So I wanted to be sure you were one of the first to receive not only a finished copy, hot off the presses, but a signed copy by the author". We do not know who "Linda" was, apparently from references in the second paragraph, a bookseller. ___DESCRIPTION: Quarter yellow laid paper with ivory paper boards, title in gilt on the front board, gilt lettering on the spine, title page in grey and black; octavo size (9.25" by 6.25"), pagination: [i-viii]  2-451 [452-453], inscribed by Kathryn Stockett on the title page. In a pictorial paper dust jacket with title inside a purple oval, purple and black lettering on the spine, praise for the book on the rear panel, a description of the book on the front and rear flap with author bio on the rear flap; dust jacket is unclipped with the original price of $24.95 on the front flap. ___CONDITION: Volume is fine, with clean boards, a strong, square text block with solid hinges, perfectly straight corners with no rubbing, the interior is clean and bright, and entirely free of prior owner markings; head and tail of the spine are very gently bumped, else fine. The dust jacket is near fine, unclipped, clean, slight wear at the creases, else fine. ___POSTAGE: International customers, please note that additional postage may apply as the standard does not always cover costs; please contact us for details. ___Swan's Fine Books is pleased to be a member of the ABAA, ILAB, and IOBA and we stand behind every book we sell. Please contact us with any questions you may have, we are here to help.